Catherine Wong (CW): Several staff members are interested in meditation, wellness, and a holistic approach to librarianship and we noticed the need for students to have a variety of methods to help them cope with the stresses and anxieties associated with college. The various parts of the initiative developed organically as we connected existing programs and partners to form new initiatives with the goal of providing students and staff with ways to expand their mental, physical, and spiritual well-being. Tell us about the Mindful McQuade initiative. Create a quiet room for reflection with yoga mats, meditation mats with pillows, blankets, a salt lamp, and a CD player with an assortment of relevant CDs. Offer weekly programming throughout the semester. 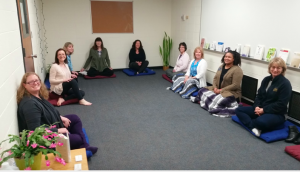 Dr. Jim Howland, Ed.D., LICSW from Merrimack’s Hamel Health and Counseling Center (HHCC) presented on MBSR (Mindfulness Based Stress Reduction) and yoga instructor and life coach Danielle Federico from Modern Spirit Wellness presented a breathwork series for anxiety and stress reduction. Purchase four exercise bicycles for students to take an active and mindful break from their studies. Exercise primes the brain for study so we felt it was a great fit to add these to the library. We purchased 2 Expresso bikes with fully immersive technology and 2 bikes with desks. This fall a graduate student in the health sciences will begin work to help promote and study the use of the bikes. Assemble themed Mindful Kits for topics such as bird watching, yoga, meditation, chakras, sound healing, creative healing, and gardening. Host environmental movie nights throughout the semester. 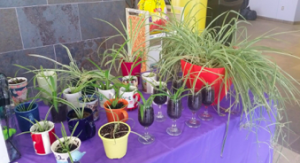 Hand out plants (mostly offshoots from our spider plants) for residence halls and offices. We potted these up in mugs so this was a high-impact, low-cost initiative. People love getting a plant! How did you align Mindful McQuade with other student wellness programs on campus? McQuade Library was already partnering with HHCC to have chair massages and pet therapy visits during stressful finals weeks as well as full-spectrum light therapy lamps available for checkout so it was easy to expand that partnership. We created new partners with faculty from various departments and the Office of Wellness Education (OWE). 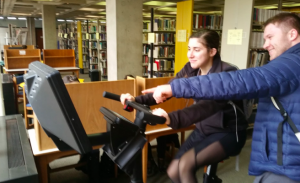 Librarians took part in OWE programming called Destress Fest at the end of the semester where we handed out plants and coloring pages, hula hooped with the students, and promoted the Mindful Kits. How did you promote and publicize the Mindful McQuade programs on campus? We promoted with announcements before library instructional sessions, with a sandwich board pointing the way to the new meditation room, newsletters, social media, and putting up signs around campus. We are expanding the programming with OWE next semester so we’ll have more student ambassadors to help spread the word as well. What kind of response have you received from students and faculty about Mindful McQuade? We have had an overwhelmingly positive response to all the initiatives. We’ve had about 20 students show up to each of the environmental movie nights and we handed out over 50 plants at the Destress Fest. We often see shoes outside the meditation space so we know it is getting use beyond class times. Students, faculty, and staff have loved the programming and the classes have been full. Spider plants provided by library to students for their dorm rooms. We have been delighted with the success of this initiative and it has caused a positive buzz on campus. It is exciting to see people try new things and experience the benefits of MBSR and breathwork to calm their mind. We were pleasantly surprised by how much the students loved getting a plant for their room and once word got around campus, many staff also stopped by the library to pick up a plant!